Seriously, take a look at that face. You wouldn’t want to get between her and her chicks would you? 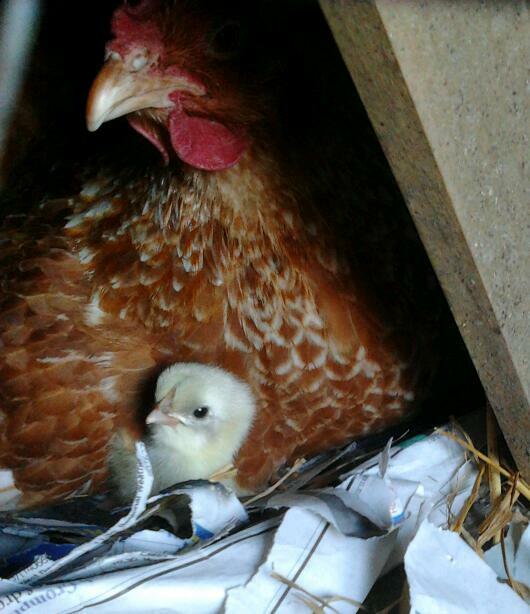 Technically not her chicks, well I suppose they are now. 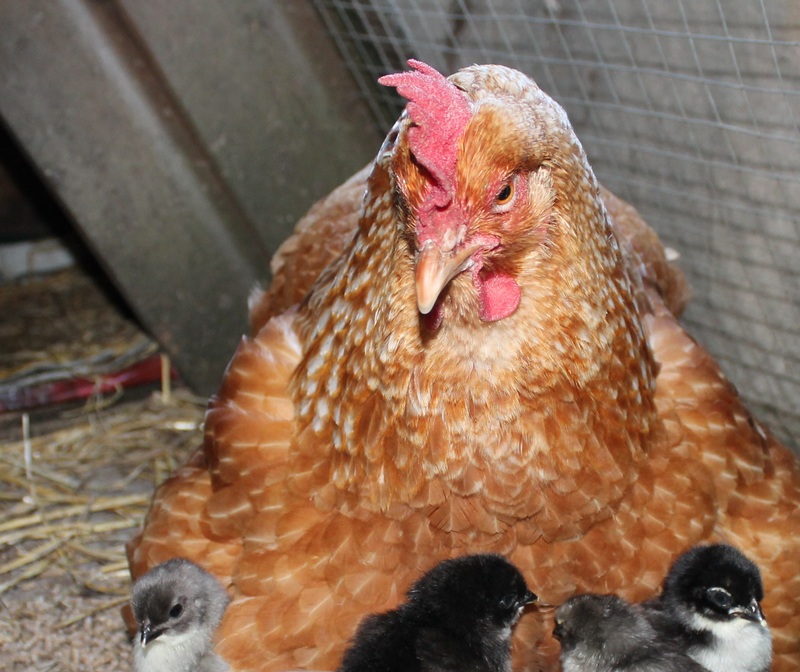 These hatched in the incubator over the weekend, and last night we slipped them under this broody hen, removed the fake egg she was nursing and now she is a proud, fierce mother of eight. She is excellent for these fosterings, as soon as we slip the first one under she is clucking and shuffling her feathers to make room.. and yes pecking the hell out of the hand that delivers the next chick into the warmth of her feathers. 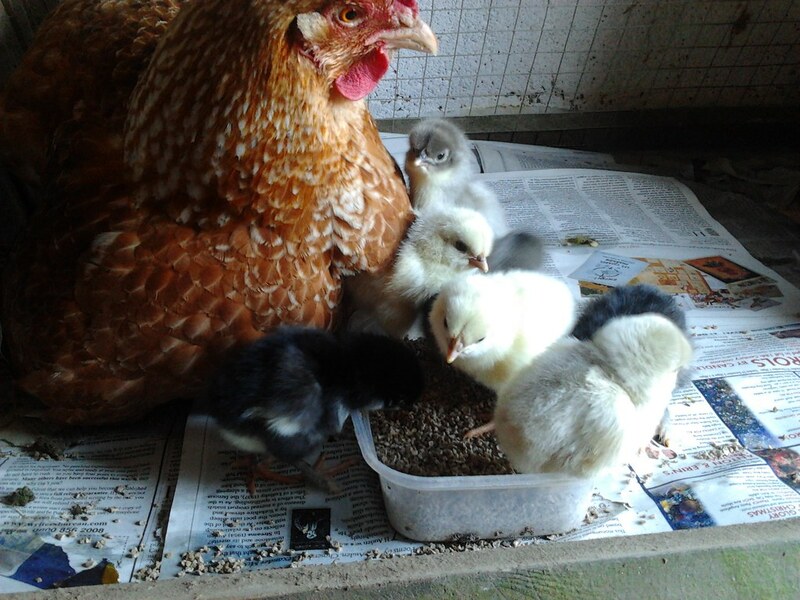 The chicks seem pretty happy with the arrangement too. The eggs we set just before mothers day have hatched. 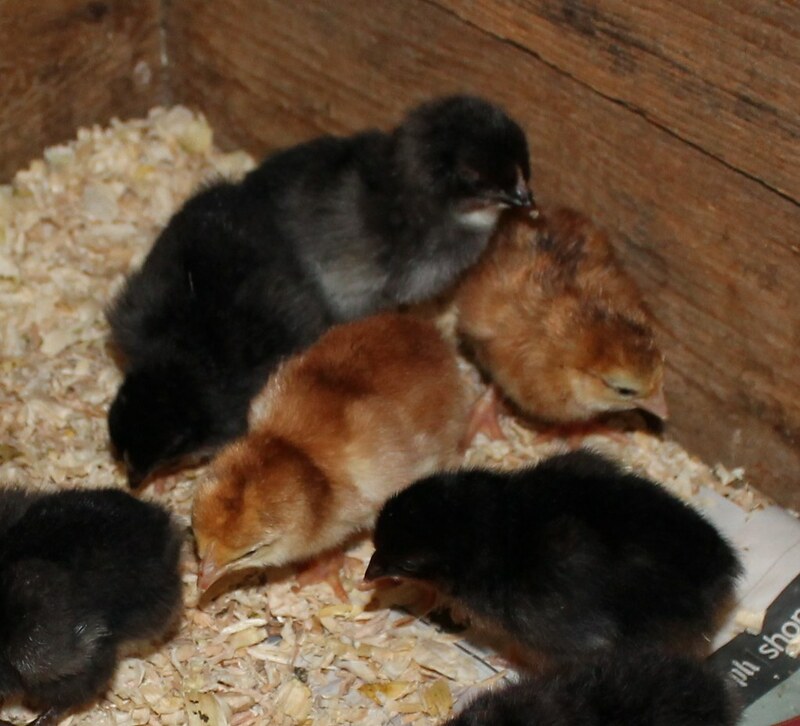 These were from my dark brown layers – the French blue marans – resulting in a mix of blue, black and splash marans, which we then fostered onto our old reliable broody. She’s a good girl and very defensive of her babies.. all fifteen. At first we don’t get to see them, unless they cannot resist a peak from the safety of her feathers, but then she will bring them out to show them the food and water. 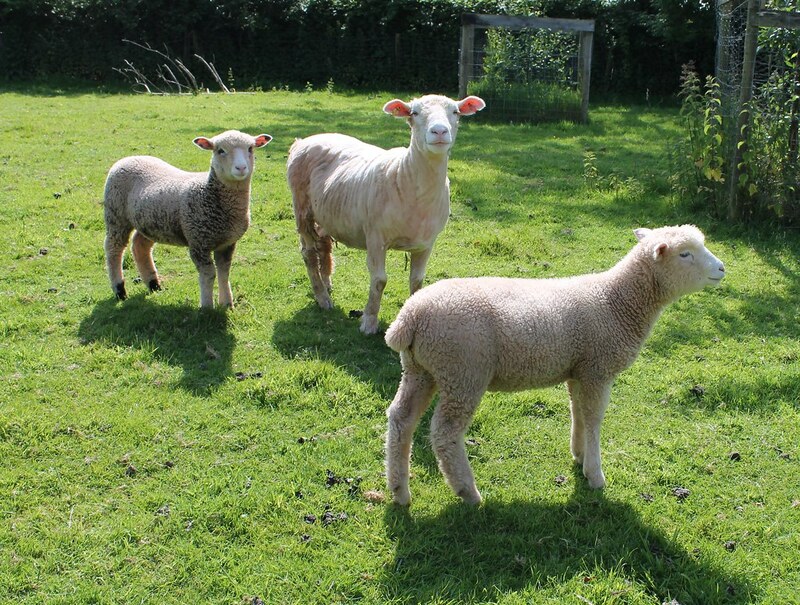 We moved them out to a pen this morning, and they enjoyed bathing in the warm sun. All in time for the Easter weekend. Easter is a moveable feast – and this doesn’t mean you can eat your chocolate egg at home or in the park (although you can, it is up to you! ), it means it is calculated on the moon phases, to be exact, it is the first Sunday after the first full moon after the spring equinox. Bit of a faff eh? and then all those other dates tie into it – such as those we do celebrate: pancake day, and a whole bunch of others we don’t observe in this household. One we do nod at is Mother’s day, which moves about in relation to Easter, being on the fourth Sunday of Lent, and therefore always three weeks before Easter. In my mind Easter is all about spring, fertility, new beginnings, new life etc and I have waxed on before about my opinion that the whole ‘no eating eggs’ in the few weeks before Easter means it gives the hens the chance to raise some chicks. Not a bad rule of old to live by, if you want to keep your poultry stocks up. To me the whole mothering thing seems also tied in with spring,fertility, new life. A coincidence perhaps that the time between mothering Sunday and Easter Sunday is the same amount of time it takes for an egg to become a chick. If you want chicks for Easter, always set them on mothers day. I set some a couple of days ago and hoping for chicks come Easter. 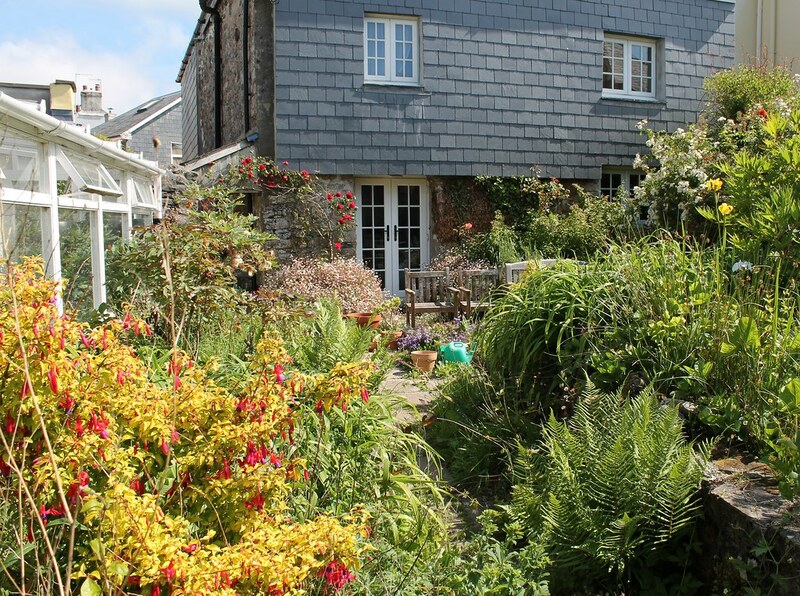 Today does seem suddenly full of hope and new life – helped along by the clocks changing, and a day of hot sunshine. 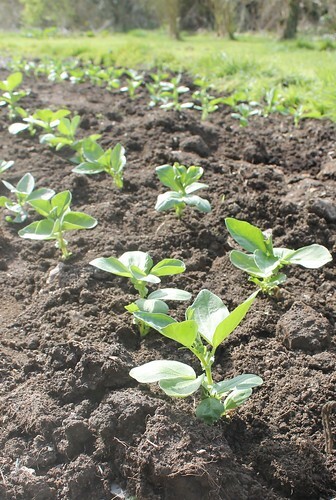 Seedlings are popping up in the greenhouse, older seedlings being hardened off, and some making their way into the veg patches. I’ve been very good and held off hatching all through the really horrible weather but suddenly having two broody hens pushed me into action, and a good opportunity to see how Eddy, my new Rhode Island Red cockerel was getting on with his girlfriends. 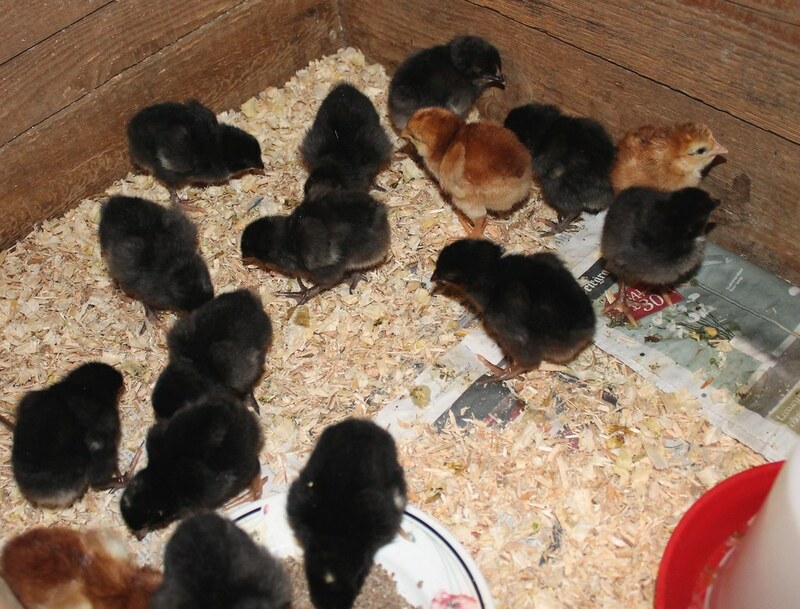 The result is these ten RIR chicks. 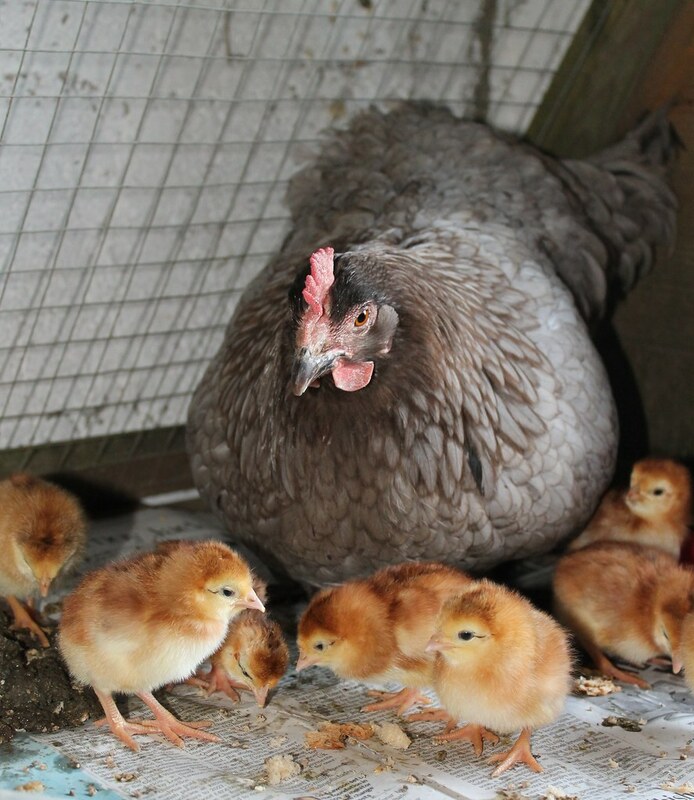 As per my preferred method of hatching, we set the eggs in the incubator, then fostered them onto the broody by sneaking them under her at night. 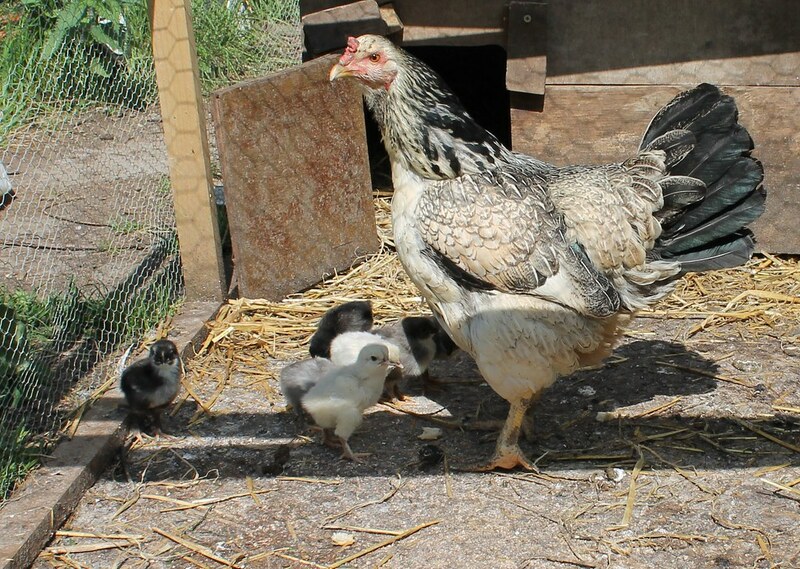 Always a worry that she will reject or worse attack them, and as this is a new, young, inexperienced broody, worse so – but how else do you establish if you have a good hen unless you give her a try? 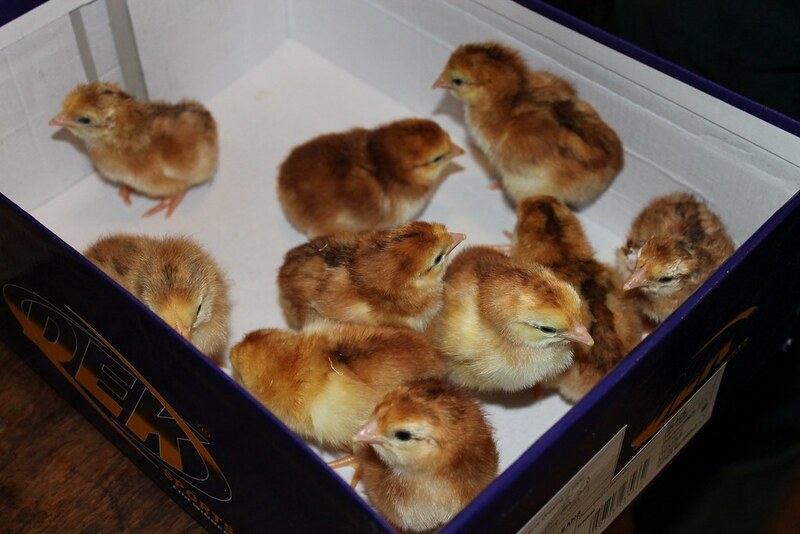 So we carried out the box of chicks and under they went. This morning the hen is doing a good job mothering them, telling them about the food and water, brooding them to keep them warm and generally telling us to go away. 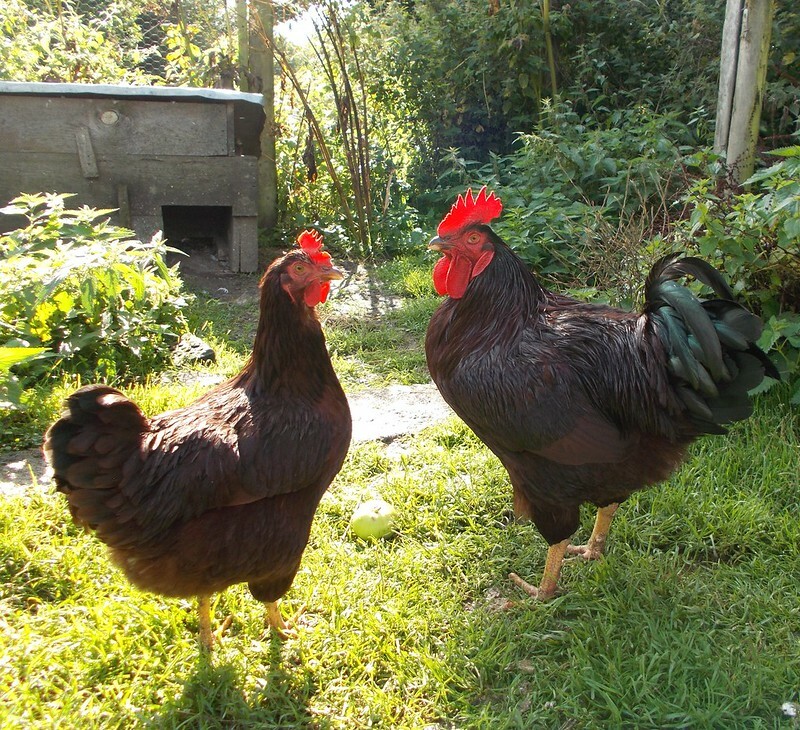 Meet Eddie and his girlfriend, they are both Rhode Island Reds and represent a new venture for us. In addition to this pair, I also raised some chicks, and introduced some RIR pullets to the pen, much to Eddie’s delight. They are all hatched this year, so Eddie has some growing to do yet, and will develop longer tail feathers, but so far I am very pleased with them as a breed, Their plumage is beautiful, a glowing chestnut browny red. Eddie is friendly and non aggressive, and attentive to his harem. The chicks were a lot later to feather up than other breeds – something I will have to keep in mind when planning hatches, but the plus side is the cockerels don’t start crowing until around 20 weeks – a really good trait if you raise the spare cockerels for the pot and yet still want to have good relations with your neighbours! 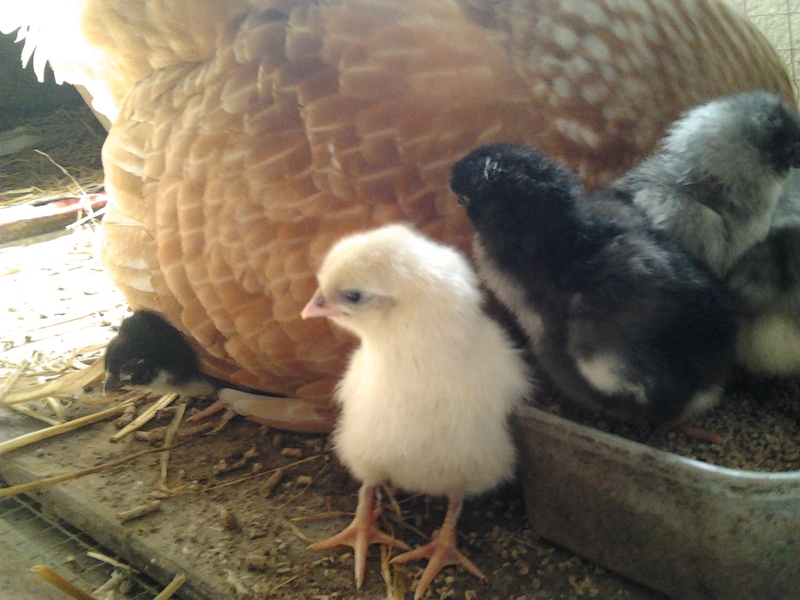 The older pullet came into lay at about the same time, and has laid an egg every day since – ideal! 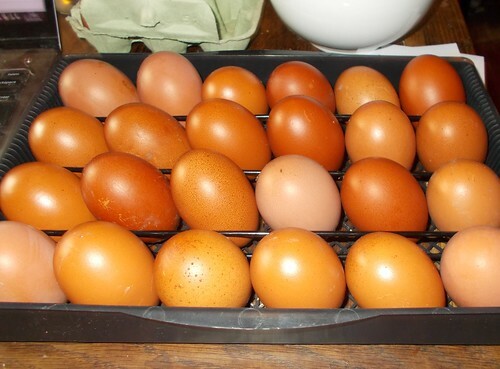 So, for 2014 I hope to be able to offer Rhode Island red pullets for sale,, and will also be trying some crosses, with my French blue marans, and Plymouth barred rocks, as these are all said to make excellent crosses, with lots of hybrid vigor – i.e good egg layers!